Last August Dad became an Elder in our Church. Becoming an Elder in our church is a lot harder than it is in most churches, I would guess. Dad had to study for months to take a big long test before he could be approved. He was rushed through the process because our Church needed another Elder. Then just a short while after Dad was ordained, our church decided to switch denominations from the PCA to a much smaller, more conservative denomination. Dad had to immediately start studying for a much longer, harder test to be completed in a shorter time space. Dad is in Tennessee this week for the church conference of our soon-to-be new denomination, and yesterday he was questioned for three hours by a panel of six men to see if he met the standards to continue to be an Elder when we switch denominations. He wasn't approved, but he is a candidate, which means another interview in the fall. I guess I am slightly frustrated, though I'm trying not to be, at this whole process. It's been maybe a year since we started down this road. To require so much of Dad in such a short time frame when he has a family still at home, a full time job, a business on the side and an acreage, seems a lot to ask. If you haven't been studying this theology for years and years, it's hard to cram enough of it in your head to be able to answer surprise questions under pressure! Dad is willing to serve, but the standards are so high. This post has been my opinion on the affair. I needed to vent. I hope you understand. In another attempt to make people see how enjoyable it can be to visit cemeteries, here is another bunch of pictures. I stopped at two different cemeteries on my way home from Lincoln last week, and now I'm out of cemeteries to visit on the route home. 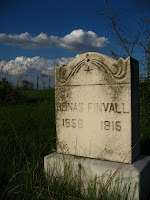 The first cemetery was the beautiful Swedish cemetery of Fridhem off of highway 77 near Ceresco. It was on a hill with a beautiful view; there were lilacs and flowering trees, cute benches, very well kept-up. They are peaceful. There's just peace and quit. I prize that! It's very relaxing. I am not an extrovert. So, I love the quiet. They are beautiful- both the landscaping and the stones themselves are a form of artwork! I enjoy art. They are historic. 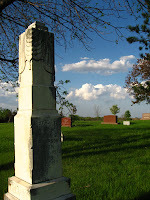 Nebraska's pioneers are buried in these places. 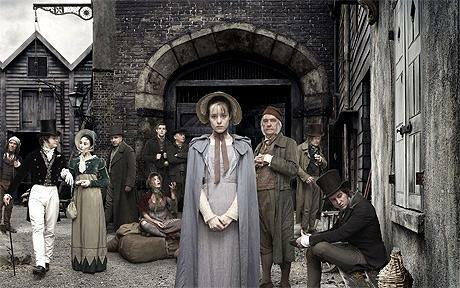 I respect them, and it is good to look back and think of those people who came before us. I get excited over history. Cemetery number two was Elim Lutheran-I think- near Hooper. Not as pretty as Fridhem, but it has some really old stones. The older the stone, the better. 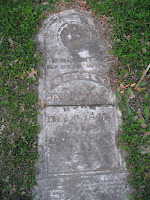 I just became a member of Find-a-Grave, which is similar to USGenWeb's Tombstone Transcription Project. 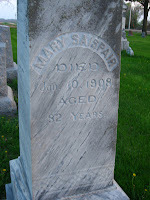 Since I am also interested in genealogy, contributing to these projects makes sense to me, and I hope to do more tombstone transcription over the summer. Well, I guess I've talked enough about cemeteries for one post. I just wanted to share with you my love of cemetery visiting. My family thinks it's kind of strange, and I'm guessing most people think the same. South side, taken by the Governor's Mansion while walking on the way to the office. Jen and I have been taking turns driving to Lincoln every week to Volunteer at the Capitol. The work is slightly mundane and not very useful(at least, sometimes I feel like I'm not being very useful), but it's been a great learning experience just being in the State Capitol. 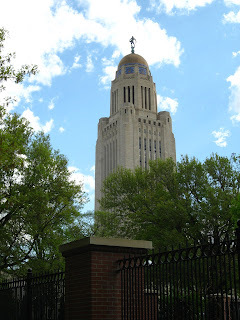 I'll only be going one more time and then session will be over, but I am grateful that I have been able to learn more about our Nebraska Legislature. This past week was my week to go to Lincoln. On Wednesday I spent the day writing letters of response to those people who contacted the Senator's office; and when I got done with that I did an overview of LB 218, which was about county aid. I'm pretty sure LB 218 was voted through yesterday. You know, interesting things happen in the city. I hate parallel parking, so I always end up parking far away from the capitol in the easy parking places, usually in the same spot-across from the pink house with purple trim. I am really trying to remember this is the city, so lock the car- but I worry that it might get stolen anyway. I worry too much. On Thursday I spent the day searching online for the phone numbers of people in the district who have unclaimed property. Thankfully there were other things going on so I had a few good breaks! So there's a quick picture of what my week was like. How was yours?